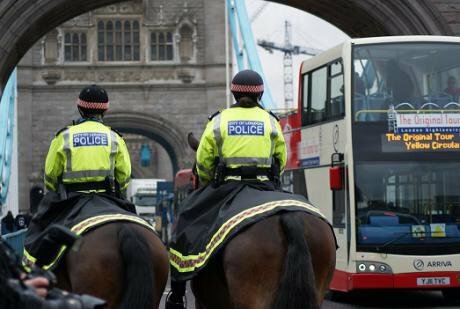 City of London Police Horses by PC Matt Hone. Wikimedia Commons. Some rights reserved. In her speech in Slough on the 6th June, the prime minister said that she was examining how to make it easier to deport foreign terror suspects and to increase controls on extremists who are thought to represent a threat but who cannot be prosecuted for lack of evidence. In other words, how to circumvent the legal system in the case of those who the authorities have decided, but cannot prove, are terrorists. Such arbitrary and authoritarian behaviour would be a clear breach of this country’s obligations as a signatory to the European Convention on Human Rights, but, nothing daunted, Theresa May, no friend of the Convention when she was Home Secretary, added: “And if human rights laws stop us from doing it, we will change those laws so we can do it”. Such arbitrary and authoritarian behaviour would be a clear breach of this country’s obligations as a signatory to the European Convention on Human Rights. Not only are such chilling pronouncements entirely inappropriate in a democracy, but they flatly contradict the commitment in her own manifesto not to rip up or amend the Human Rights Act before Brexit, nor to withdraw from the Convention for at least five years. Thus, just days from the election, the prime minister performed yet another screeching U-turn, advancing ill thought-out and counter-productive policies for the sake of electoral advantage, and crudely exploiting a terrorist atrocity. Any attempt to amend the Human Rights Act before its possible repeal post-Brexit would require a derogation under the European Convention on Human Rights. This consists of a partial and temporary withdrawal from the Convention and involves declaring a state of emergency, on the grounds of there being a "threat to the life of the nation". However derogations can be made only “to the extent strictly required by the exigencies of the situation”. These are permitted in respect of Article 5, the right to liberty and security, which protects individuals against arbitrary detention by the state, such as internment – indefinite imprisonment without charge or trial. Even before May made her speech, there were calls for such a measure to be introduced in the UK. 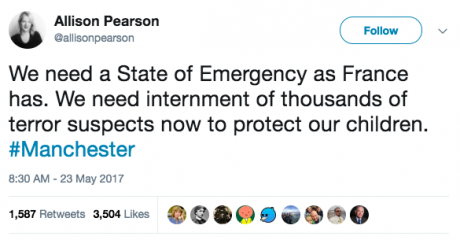 Telegraph columnist Alison Pearson tweeted on 23 May, in the wake of the Manchester bombing: “we need a State of Emergency as France has. We need internment of thousands of terror suspects now to protect our children”. Allison Pearson. Twitter. Public domain.On 25 May, speaking on Good Morning Britain, Colonel Richard Kemp, a former chair of Cobra (the government committee set up to deal with national crises), argued that "every single person who we have intelligence upon, who is known to be involved in terrorism, who is not a UK citizen and who we cannot prosecute in the court, we get rid of out of this country. We deport them, we send them back to where they came from”. When it was pointed out that the Manchester bomber was British, he replied: "We intern him if he can't be deported.” And on 28 May in the Mail on Sunday, Tariq Ghaffur, former Assistant Commissioner at Scotland Yard, wrote: “we face an unprecedented terrorist threat in Britain – about 3,000 extremists are subjects of interest to MI5 and police, and about 500 plots are being monitored. Add more than 400 jihadis who have returned from Syria and you realise the numbers are way too many for the security services and police to monitor. The atrocities of Manchester and Westminster have shown that ordinary surveillance, monitoring and tagging are not working. The time has come to set up special centres to detain these 3,000 extremists”. Couldn’t happen in Britain? Really? In fact, it has happened twice in relatively recent times. On 9-10 August 1971 in Northern Ireland, the British army arrested and interned 342 people suspected of being involved with the IRA. This action, known as Operation Demetrius, was proposed by the Northern Ireland government and approved by the British government. It unleashed four days of violence in which 20 civilians, two IRA members and two British soldiers were killed. All of those arrested were Irish nationalists, the vast majority of them Catholic, but, thanks to faulty intelligence, many had no links with the IRA at all. On 9-10 August 1971 in Northern Ireland, the British army arrested and interned 342 people suspected of being involved with the IRA. The introduction of internment, the brutal manner in which the arrests were carried out, and the subsequent abuse of those rounded up, led to mass protests, a rapid escalation in violence, and a very large number of people joining the IRA. The policy lasted until December 1975. During that time 1,981 people were interned, of which 1,874 were nationalists and only 107 loyalists, even though loyalist paramilitaries carried out numerous acts of violence against Catholics and Irish nationalists. Indeed, it was not until February 1973 that any loyalists at all were interned. The Irish Government, on behalf of fourteen internees who became known as the ‘Hooded Men’ because of one of interrogation techniques to which they had been subjected, took the case to the European Commission of Human Rights, which in 1976 stated that it unanimously considered that the combined use of these techniques amounted to torture, on the grounds that "the systematic application of the techniques for the purpose of inducing a person to give information shows a clear resemblance to those methods of systematic torture which have been known over the ages... [as] a modern system of torture falling into the same category as those systems applied in previous times as a means of obtaining information and confessions”. Mural at Bogside in Derry. Wikimedia Commons. Public domain.However, the European Court of Human Rights ruled on appeal in 1978 that although the techniques breached Article 3 of the European Convention on Human Rights, in that they “undoubtedly amounted to inhuman and degrading treatment”, they did not “occasion suffering of the particular intensity and cruelty implied by the word torture as so understood”. When US lawyers paved the way for the CIA’s “enhanced interrogation programme”, they reached straight for the Ireland v UK case. This ruling was to have truly momentous consequences. When lawyers in the United States Attorney General’s office prepared legal advice to pave the way for the CIA’s “enhanced interrogation programme”, they reached straight for the Ireland v UK case, and it came subsequently to be used as justification for the Bush administration’s infamous “torture memos” outlining what interrogation techniques could and could not be used on detainees in Guantanamo and other such centres. However, in 2013, declassified documents in the National Archive uncovered by the RTÉ programme 'The Torture Files' finally revealed that torture had indeed been carried out at the interrogation centre at Ballykelly, although, in point of fact, all the details were there in 1974 in John McGuffin’s book The Guineapigs, but this was withdrawn by its publishers, Penguin, within a week of publication following intense pressure from the British government. The newly revealed documents included a 1977 letter from Home Secretary Merlyn Rees in 1977 to prime minister James Callaghan, which states: “it is my view (confirmed by [Northern Ireland Prime Minister] Brian Faulkner before his death) that the decision to use methods of torture in Northern Ireland in 1971/72 was taken by ministers – in particular Lord Carrington [Secretary for Defence]”. The human rights group, the Pat Finucane Centre, accused the British Government of deliberately concealing this information from the European Court and European Commission hearings, and also from the inquiry into the interrogations set up in 1972 by the British government and chaired by the Lord Chief Justice, Lord Parker. In December 2014 the Irish government announced that it would ask the European Court of Human Rights to revise its judgment in the “Hooded Men” case, and the Minister for Foreign Affairs, Charlie Flanagan, stated that on the basis of the new material, the government would contend that the ill-treatment should be recognised as torture. Nine of the survivors, backed by the Irish government, are now seeking to take their case back to the European Court. Given that the original judgement has become the benchmark by which countries calculate the legality under international law of their “enhanced interrogation” techniques, the stakes could not be higher. However, undaunted by its experiences in Northern Ireland, the British government introduced internment to the mainland in the aftermath of 9/11, when international terror suspects were detained indefinitely without trial in Belmarsh and Woodhill high-security prisons. 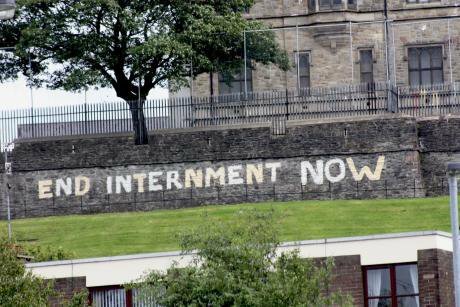 Undaunted by its experiences in Northern Ireland, the British government introduced internment to the mainland in the aftermath of 9/11. In 2002 and 2004 the internees were visited by members of the Council of Europe’s committee for the prevention of torture (CPT), which found that “detention had caused mental disorders in the majority of persons detained” and “for those who had been subjected to traumatic experiences or even torture in the past, it had clearly reawakened the experience and even led to the serious recurrence of former disorders”. The committee concluded that for some of the internees “their situation at the time of the visit “could be considered as amounting to inhuman and degrading treatment". Their report was delivered in July 2004 to the UK government, which sat on it until July 2005. The treatment of the internees was ruled unlawful in December 2004 by the Law Lords (the forerunners of the Supreme Court), who, of course, had not actually had sight of the CPT report. They justified their decision on the grounds that there was no "state of public emergency threatening the life of the nation", and ruled that the measure was a disproportionate interference with liberty and equality, one that unlawfully discriminated against foreigners because British terror suspects thought to pose a similar risk could not be locked up without charge or trial. Lord Scott described the regime under which suspects can be detained indefinitely on the say-so of the home secretary with no right to know the grounds for detention as "the stuff of nightmares, associated with France before and during the revolution, with Soviet Russia in the Stalinist era, and now associated, as a result of section 23 [of the Anti-terrorism, Crime and Security Act 2001], with the United Kingdom". And Lord Hoffman stated that "the real threat to the life of the nation, in the sense of a people living in accordance with its traditional laws and political values, comes not from terrorism but from laws such as these”. In March 2005 the internees were released from prison but put under control orders, essentially house arrest, which had been brought in via the Prevention of Terrorism Act 2005 to replace internment. But these orders too turned out to be highly controversial, being branded by one judge “an affront to justice” and criticised by Alvaro Gil-Robles, the Council of Europe's human rights commissioner, who argued that they “flout the right to the presumption of innocence”. When it comes to dealing with terrorism, it does appear as if British governments are quite incapable of learning from past mistakes, namely reaching for tough-sounding ‘solutions’ which are both counter-productive (in that by provoking anger and resentment in certain people they drive them straight into the arms of the terrorists) and unworkable (in that they are incompatible with both domestic law and our international commitments, such as the European Convention). Of course, there’s another way of looking at this, one much favoured by most of Britain’s national press, which is to argue that the terrorism problem could be solved if only judges didn’t act as ‘enemies of the people’, courts would do as the government says, and we could free ourselves of the shackles of the Convention. However, a country with no formal separation of powers and devoid of justiciable rights is not one in which most people would want to live, and in which the terrorists would, to all intents and purposes, have won the day. As Sir Keir Starmer recently put it: “If we start throwing away our adherence to human rights in response to what has happened in the last three months, we are throwing away the values at the heart of the democracy, everything that we say we believe in”. Furthermore, as the UN high commissioner for human rights, Zeid Ra’ad al-Hussein, put it in a recent speech to the British Institute of International and Comparative Law: “Whatever the intention behind her [May’s] remarks, they were highly regrettable, a gift from a major western leader to every authoritarian figure around the world who shamelessly violates human rights under the pretext of fighting terrorism”.